Yuyudo Publisher - In the early 20th century, the Yuyudo publishing house had already distinguished themselves as one of the finest publishers in Japan. They adhered to the same exacting standards of 19th century publishers while some of their publishing colleagues took shortcuts. In the 1950's, as interest Edo era woodblock prints was reigniting, Yuyudo embarked upon a project to produce reprints by the great masters from the Golden Age of Ukiyo-e. They hired the finest woodblock printers and carvers in the world for this endeavor. The resulting prints were some of the highest quality reproductions ever made. We are pleased to offer this beautiful reprint from the Yuyudo publisher in our auctions today. Yuyudo prints are exceptionally well done and very finely printed. Each bears a Yuyudo Publisher stamp on the margin or reverse. Bid now on prints from this fantastic collection! 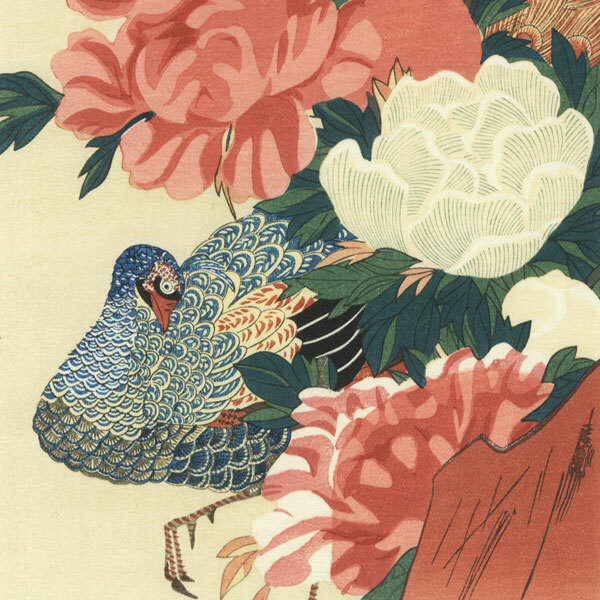 Comments - Gorgeous Hiroshige pillar print featuring an elegant peacock posed among large peony blossoms. Wonderful detail in the carefully drawn feathers and lovely color with soft shading in the background. A striking subject that would make a beautiful framed display.